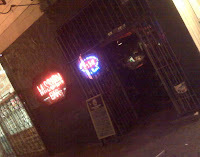 With barred windows and black exterior the Mission Bar has an intimidating and bleak façade. 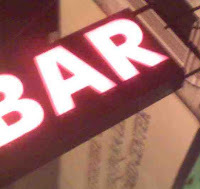 Its nondescript marquee reading only “Bar” calls to mind the drab and seedy bars depicted in graphic novels and film noir. Were the windows laced with iron bars there to keep trouble out or to protect the public from what was inside? Passing through the door, the interior had the same overcast mood as the exterior with dark colors and muted lights. Expecting to discover a pub full of shady characters, I found instead a much tamer bunch. A group of early 20- something girls sat at the bar near the entrance in their Friday night best ready for a night of drinking and dancing. Along the wall there was a row of stuffed, vinyl booths – one of which hosted a handful of young Latinos guys catching up after a long day of work. Further down the bar a few nicely dressed couples drank before their late night dinner reservations. Rounding out the collection of patrons, a group of regulars were perched at the end of the bar near the pool table. Some were chatting with Walter, the bartender, while others sat on their stools necks cocked back watching the game. A few others just stared into their beers. 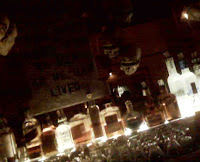 The bar’s elaborate Halloween decorations were impressive. A pack of rats scurried down the wall as spider webs, skeletons and tombstones, with the names of Jesse James, Billy the Kid and Doc Holliday, adorned the walls. 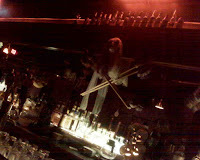 Two skeletons hung from the ceiling copulating to the alternative music that wafted out of the juke box. After a long and taxing work week I was delighted that the Mission had landed me at a nice, mellow neighborhood bar where I could enjoy an ice cold beer and watch my alma mater—the San Jose State Spartans—go against the Boise State Broncos. Walter and the female bartender were courteous and attentive with just the right amount of attitude—a quality that I have come to appreciate among Mission Street bartenders. Great service paired with just enough edge to handle the variety of personalities that drift off Mission Street and up to their barstools every night. Arriving right before 8pm, I was just in time to take advantage of $2.50 happy hour drafts and I stayed long enough to watch an ebb and flow of customers come through the door. I wasn’t looking for much but I got exactly what I needed, a great neighborhood bar. Nothing too exciting but a place that many—including myself—can call home.